If you’re involved in a business that needs airfield access, wants close proximity to an airport or are looking for solid industrial property in an ideal location, the Tucson Airport Authority (TAA) has sites available to help you unlock the potential for success. With two unique and separate airports, no idea is too big or too small for TAA and its partner Sun Corridor Inc. to try to tackle. 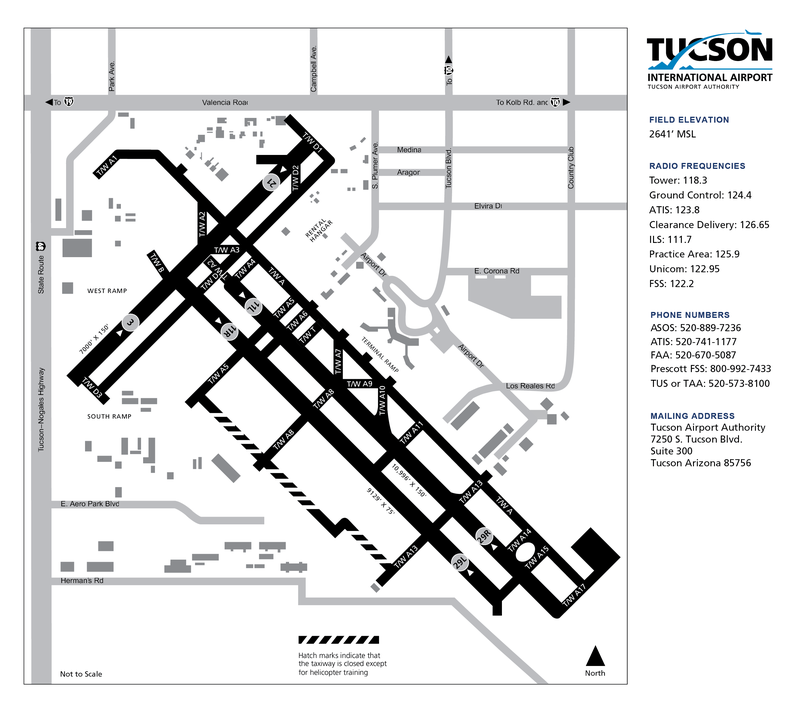 Tucson International Airport (TUS), at more than 8,300 acres, is one of the 10 largest commercial airports in the United States. Ryan Airfield (RYN), with more than 1,800 acres, is a general aviation reliever airport with the only air traffic control tower in Southern Arizona staffed under the Federal Aviation Administration’s Contract Tower program. And, being in Southern Arizona, both airports are ideally located to take advantage of delay-free flying weather year-round. The Tucson Airport Authority has partnered with Sun Corridor Inc., Southern Arizona’s “one stop shop” to facilitate smooth communications between site decision-makers and local leaders who can make things happen to get your business here. Sun Corridor Inc. can provide answers to your questions about properties, permitting and development, regional workforce, foreign trade zone opportunities, and local, state or federal incentives. If confidentiality is a concern Sun Corridor Inc. can help you there, too. Sun Corridor’s contact information is below (click on the logo to go to the website). TUS, eight miles south of Tucson’s central business district, is the commercial airport serving a catchment area of more than 1.4 million residents living in southern Arizona and northern Sonora, Mexico. The airport is less than 4½ miles from either Interstate 10 or 19 and less than 9 miles from the Port of Tucson, a 770-acre full-service inland port offering unrivaled logistics and warehousing opportunities, including more than 1.8 million square feet of improved space, refrigerated storage and distribution. The airport has three runways. The primary commercial runway (11L/29R) is 10,996 feet. A parallel runway, used by general aviation aircraft, is 8,408 feet. The third runway (3/21) is 7,000 feet and is used when required by cross-wind weather conditions. TUS is a U.S. Port of Entry with 24-hour processing services of U.S. Customs and Border Protection. Current airfield tenants include Raytheon Missile Systems, Bombardier Aerospace, Aerovation, Ascent Aviation Services, 162nd Arizona Air National Guard, SkyWest Airlines, Federal Express and Rolls-Royce Aircraft Engines. Companies with facilities nearby include: Manufacturers CAID Industries, Chamberlain Group, Faribault Foods (La Costeña, S&W, Sun Vista, Luck’s and private labels), Global Solar, Kloeckner Metals, Rain Bird Corporation, Sion Power, Universal Avionics and Zucarmex USA (Zulka); Technology Arizona Center for Innovation, IBM, Intuit and University of Arizona Tech Park; Fulfillment Amazon and Target; Distribution American Tire Distributors, HomeGoods Distribution Center, Materion Ceramics, Safelite Auto Glass and Si Inc.; and Logistics DHL Global Forwarding, Federal Express Ground, Old Dominion Freight Lines, Port of Tucson and Supply One. RYN is a general aviation reliever airport about 10 miles southwest of Tucson. Ryan Airfield’s history goes back to 1942 when it was established as an Army base and flight school training World War II pilots. RYN has grown to more than 1,800 acres. The airport’s air traffic control tower is the only tower in southern Arizona staffed under the FAA’s Contract Tower program. It operates 6 a.m.-8 p.m. daily. The airport has 30 tenants, including aircraft maintenance companies and flight charter operators. More than 300 aircraft are based at RYN. At an elevation of 2,415 feet, RYN has three runways. Two are parallel with an east-west orientation; 6L/24R is 4,900 feet long and 6R/29L is 5,503 feet long. Runway 15/33 is 4,000 feet long. All three runways are 75 feet wide. RYN has both existing facilities and development sites available. Current airfield tenants include aircraft maintenance, repair and overhaul service providers, including firms specializing in such things as avionics and interior finishing, as well as flight instruction schools and aircraft rental firms.